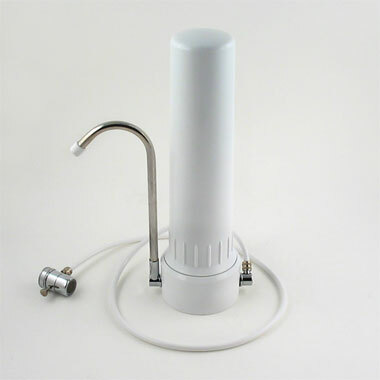 Pure Water Products announced in September 2012 that its Model 77 countertop water filter is now 25 years old. And the amazing thing is that in 25 years the price, $77 with shipping to US addresses free, has never changed. Among the unique properties of the product is its lifetime guarantee, which covers all parts except the replaceable filter cartridges. Pure Water Products first made Model 77 in 1987, the company’s second year in operation, as a low-cost alternative to aggressively marketed stainless steel and silver/carbon countertops that were popular at the time. Classic Model 77 with Standard Spout and Filter Housing. The most popular style. The company credits the product’s success to its simplicity. It attaches easily to most faucets and it’s easy to move. It requires no professional installation. Installation usually takes a couple of minutes, as does the annual cartridge change. Although it’s simple, it is quite effective and versatile. 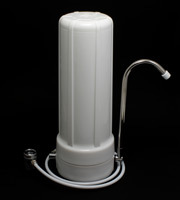 The standard unit accepts any 9.75″ X 2.5″ filter cartridge (by far the most common size made), so it can be applied to a variety of water treatment situations. The standard cartridge is a chlorine-hungry MatriKX carbon block. The alternative “candle” style slimline Model 77 accepts Doulton ceramic candles as well as screw-in carbon blocks. Model 77 Slimline. This Model Accepts Doulton Screw-In Candle Cartridges As Well as Our Own Slimline Carbon Blocks. For more information about Model 77. For information about the double version of Model 77.